Earlier this month, a story about Russian submarine activity made a few headlines. Part of that was the misleading title, which said that "Russian Submarine Activity at Highest Level Since Cold War." Quite a few people noted that this cannot possibly be true - Russia simply doesn't have enough submarines to maintain a level of activity that would be comparable to that during the Cold War. Indeed, the actual quote, attributed to Vice Admiral Clive Johnstone, Commander of NATO's Maritime Command, was that Western sub commanders are reporting "more activity from Russian submarines than we've seen since the days of the Cold War" (emphasis added). 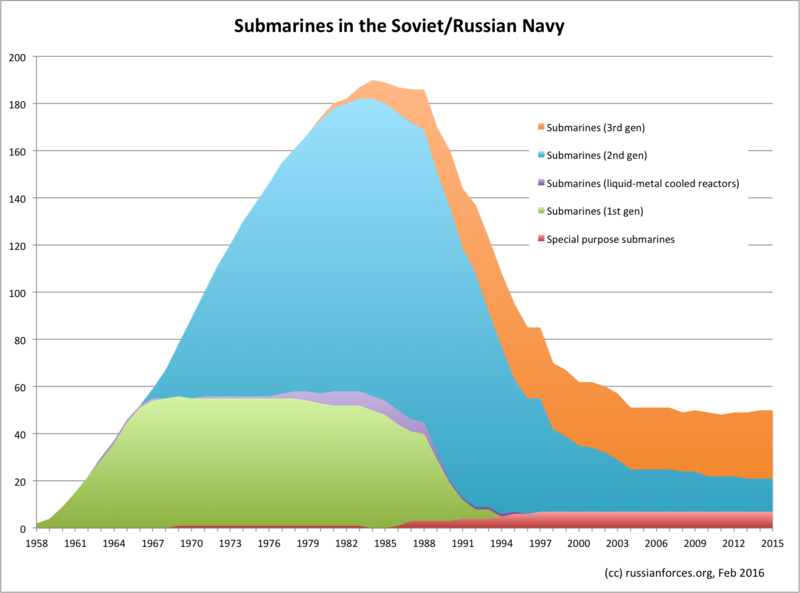 That's quite a different matter - it is quite possible and even likely that Russian submarine activity today is at its highest level since the early 1990s. I thought it might be a good occasion to publish a chart that I prepared as part of a project on HEU use in Russia. 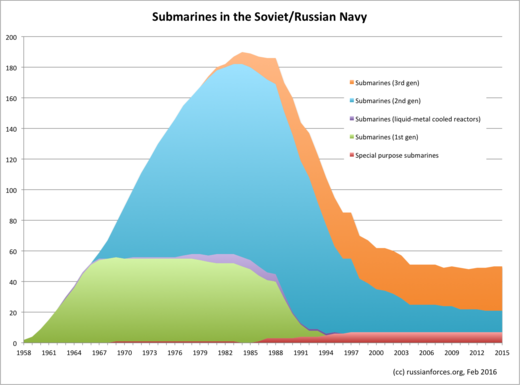 It shows the change in the number of submarines in service from the early years of the Soviet program to the end of 2015. It is an estimate, of course, so it should be treated as such. Since the chart was about HEU consumption, the submarines are grouped by generations that correspond to generations of nuclear reactors. I assumed that the reactors on Project 955 and Project 885 submarines are essentially third-generation reactors. Also, it should be noted that the number of operational submarines that can actually go on patrol, is somewhat smaller. Of the 42 submarines included here, as many as 19 are undergoing overhaul. This number includes 13 ballistic missile submarines and 27 cruise-missile and multipurpose submarines. It also includes Project 09786 Orenburg and Project 09787 Podmoskovye submarines that appear to be carriers of deep-submersible stations. The stations are in the "special purpose submarines" category. It includes seven of them, even though the exact operational status of these stations is not always clear. Pavel, curious to the before mentioned Project 09786 Orenburg and Project 09787 Podmoskovye submarines. Are these converted Yankee-Class “stretched” boats or the submarines of the Uniform-Class? Forgive my NATO designations. Can you provide a named working list of the other 40 nuclear submarines you referenced in your post? And, yet another request. I was unclear of your term “station”. I’m assuming you are referencing small, deep diving, “conventional” powered submersibles that are transported by the Orenburg and Podmoskovye for special missions. For my clarification, these seven or so “stations” are not nuclear powered, correct? The Russian nuclear submarine force is a topic worthy of much discussion. Project 09786 is Delta III Stretch, 09787 is Delta IV Stretch. Yes, the "stations" are (believed to be) carried by larger submarines. And they are nuclear-powered. I'll try to put together the submarine table later. I remember reading(I can't remember where) that ballistic missile subs can launch their missiles from home base(without being on patrol). Yes, Delta III and IV subs can launch their missiles from the pier. Not sure about subs with solid-propellant Bulavas. So I would add that the readiness has suffered a great deal of improvement post 2010, with the repair and refit programs (it is most visible on the Akulas). And while it is still a shadow of the Soviet Navy in terms of numbers, the force is still very large and capable when compared to Navies other than the USN. You should mention the fact that these new submarines being built and deployed are far superior to 3rd gen Soviet subs from the 60s and 70s. There are many sources including wiki that claim Russia has many anti ship cruise missiles(some nuclear) that are designed specifically for taking out carrier groups. Do you have any info on these? Strictly speaking, we don't know that they are "far superior." These are new submarines, of course, so they are probably better in some respects. - improved readiness via repairs for the newer 3rd gen subs. Many of those were completed in the early 90s, making them still viable. - modernisation/refit of the older 3rd gen subs. - construction of new, 4th gen, subs. The 4th generation submarines (ie Yasen class) get new powerplant (from the 2nd boat in the class onwards) as well as a number of other features, making them indeed better than the legacy 3rd gen subs. This however doesn't make the 3rd gen class subs (ie Oscars and Akulas) less viable, especially after an extensive refit. For example Oscar-IIIs (current refit/modernisation of the Oscar-IIs) amongst other things receive UUVs and new VLS, VLS which would be probably adapted for the new Zircon hypersonic missiles. About those - currently we use either legacy Granit AShMs on the Oscar-IIs (those could carry nuclear payloads) or the torpedo tube launched Sizler/Kalibr fammily (which includes an AShM option). In the future, with the construction of the further Yasen class boats and with the Oscar-III refits we would get the platforms for the Yahont AShM (and thus it's replacement - Zircon). 1 Delta III Stretch (BS-136 “Orenburg” (Hull No “656”)) Project 09786, serving as “mothership” to carry the deep diving nuclear powered special purpose submarines. (one is visible at 69.216842° 33.381270° (8/11/2015) on google earth. Thanks so much for the data. I never quite realized the “X-Ray class” was a “transported” submarine. Much to research! Take care my friend.